Spring TrainingAfter four long and painful winter months without baseball, the Falcons return for spring training. As in previous years everyone has that extra spring in their step, eager to dust-off their gloves and get to work and give it our best as we always do. But there seems to be something different this time around. Cannot quite put a finger on it but the ball seems to be flying faster, the noise off the bat seems louder. No one says anything about it, but someone makes a good play in the field, and it is there, when players give each other that look that appears to say “let’s do it this year, let’s go all the way”. The major change this year is that the club lost its manager, Stuart Boast. Following a terrible run of injuries Stuart was honoured at the end of the 2003 season with his number 9 shirt being retired forever confirming him as a true Falcons legend. Stuart would still be around to help in whatever way he can, but it is now up to 21 year old Lee Manning to lead the team forward. It is obvious to everyone that Lee has taken his new position seriously and that he wants to succeed. His youthful enthusiasm and eagerness to work with the team has a positive effect on everyone and with advice from some of the more senior players we are certain that the team is in good hands. Unlike other years the team decides to make the spring training as busy as possible and apart from the regular practice sessions the club sets up 5 exhibition games. The results are promising with a win against fellow Division 1 team Havering, a win and a loss against Premier League teams Milton Keynes Bucks and Richmond Knights, respectively, and finally losing two games against Bracknell of the Rawlings National League. Before the start of every season the club makes a great deal of effort to make the necessary field improvements. Our magnificent council has once again agreed to provide the various building supplies which we require. However, upon arrival at the field those of us with little building experience looked at the field in horror as what seemed like 10 tons of RedGra (the material which covers around the infield diamond and around the bases) had been unloaded in the infield overnight. What are we going to do with all this RedGra? With some hesitation we turn to our teammates who have experience in such projects and we find some comfort as they nod approvingly in confirmation that this is exactly what we need. It seems hard at first but little by little the infield and the mound is relayed and levelled beautifully with a heavy machine which probably has a proper name but we just called it “the knocker”. The new bullpen mound is then constructed and we put the final touches by marking out the field with inch-perfect precision as if decorating a wedding cake. Somehow, what 7 hours earlier appeared to be a messy construction site turned into a baseball temple. Everyone seems pleased and we spent the next hour just sitting on the hill overlooking left field admiring the sight. We did not have much to say, we just enjoyed the moment. Field of Dreams? Maybe, but we just call it Grovehill. Finally, it’s showtime and our first game takes us to Birmingham where we face one of this year’s expansion teams in Division 1, the Marston Green Maple Leafs. In the build-up to the game we are interested to find that the Maple Leafs team was initially founded during the Second World War by Canadian soldiers stationed nearby and that we will be playing on the same diamond which they played on half a century ago. It was a miserable wet day and on the way to Birmingham there is the worry that the game may be postponed. We are pleasantly surprised to understand that the Maple Leafs are just as passionate about baseball as we are. In an incredible human effort they had worked from 9am and somehow had managed to remove all the water which had flooded the infield. Those who came to watch the game in the rain were not disappointed as the Maple Leafs put up a good fight in the early innings. Gradually the Falcons were getting in the groove and proved too good at the end winning 16 – 5. We started the season exactly in the way we wanted. All we had to do now was win 13 more games and we would be in the Play-offs. Prior to our second game our club was joined by what proved to be one of the most influential players in the team. John del Borrello, an Australian who has had experience in the British League several years ago with the Croydon Pirates 1 in the National League. After taking several years break from the game John and his family had just moved to nearby St. Albans. It did not take long to realize that Del Borrello was the perfect man for the clean up spot in the batting order, filling the massive hole left after the retirement of Stuart Boast. Apart from the frightening power which he brought to the plate, he also provided a competitive edge which often got him in trouble with the officials, who will most likely be mentioning him at the next Umpires’ Clinic. The Falcons machine was taking Division 1 South by storm and the team added a few more wins on the board against some tough teams including the very pesky Havering. They will most definitely be challenging for honours in the coming years with their very talented group of young and promising players. Everything seemed to be going swimmingly until 9 May 2004. We will remember this date as one of the most painful days in Falcons history. The Brentwood Stags were our opponents that day. A team that we knew were by no means a threat in the play-off chase and which we had beaten easily in recent meetings. For 4 innings things went according to the form guide with the Falcons leading 8 – 1 at the start of the 5th. And then the unthinkable happened. A spectacular collapse in the Falcons’ pitching combined with 8 fielding errors allowed Brentwood to score 17 runs in 5 innings and win the game 18 – 13. The shock among us was such that no one could explain what had just happened. Was this some type of a “Babe Ruth” curse being cast on our club? We have to give a lot of credit to Brentwood who played out of their skins, although it was too painful to admit this at the time, especially as the Brentwood players were taking pictures of themselves and the scoreboard. In our search for clues we categorically concluded that our club must have been jinxed by the scoreboard which the club had introduced for the first time in that game. Well, that scoreboard was never used again by the club. Feelings are still running high so, as things stand, it is not expected that the scoreboard will be used ever again by the Falcons. Brentwood ended up bottom of the league in 2004 (only above two clubs which folded during the year) and this made it an even more painful loss for the Falcons. That game proved to be a blessing in disguise for the team. We did not look back after that game and won the remaining 11 games finishing top of our division which took us to the promotion play-offs. This run of 11 consecutive wins included one of the most emotional games in Falcons history in what proved to be the pennant deciding game against the favourites, Croydon Pirates 2. The stage was set, last game of the season, first versus second in the table. The Falcons had beaten Croydon in the away game several months earlier and there was no fear. That is until Croydon took the field for their warm-up. All of a sudden among the Croydon Pirates appeared 4 or 5 seasoned Japanese and Korean players. Players we had not met in the previous meeting. The ball starts zipping across the field at what seemed like 100 miles an hour and these Croydon newcomers were looking like they were relatives of Ichiro, Nomo and Matsui. One of them was in fact their starting pitcher that day. Things were not looking good. Not even the “meat” of our batting line-up was able to make contact with the pitcher’s Nomo-like splitter. On top of that we were unable to contain their hitting, and we found ourselves trailing 13 – 0, with two outs in the bottom of the 4th inning. Our heads were down. Only a divine intervention could help us now. And it did come in the shape of our own Japanese “wonder boy”, Shunji. Coming up to the plate there was hardly any sounds of encouragement from a demoralised Falcons bench. And then it happened. Shunji managed to hit one beyond the infield for a base hit and instead of settling for a single, to everyone’s surprise, Shunji decides to stretch it into a double. Seemed like a bad decision, but like a bullet Shunji dives into the dirt – He’s safe at second. Suddenly the bench is alive on its feet, shouting Shunji’s name, who picks himself up, dirty like a coalmine worker, punching the air with his fists. OK, we are still 13-0 down with two outs, and maybe there was a touch of sarcasm in the cheer from the bench, but that one play turned the whole game on its head –we could believe again. That hit with 2 outs lead to 6 runs in that inning and another 9 in the next. We were back. The lead was gradually reducing and after more than 5 hours of play in the bottom of the eighth inning we scored 3 runs to take the lead 26-25. Sounds like an American football score, but that is just how crazy that game was. It was now up to our reliever Takashi Hirai to close the game, and he did it. In the greatest comeback in our history – Falcons win the pennant. Clinching the pennant in that crazy game was long forgotten. The play-offs were here – sudden death. It was time to play “October Baseball” – in August. In the Play-Off semi-final we faced the Bournemouth Sharks, which was one of the top teams from the other division. In the build up to the game an 11-man strong Falcons delegation were sent out to Windsor on a spying mission to see our likely play-off opponents. Yes, 11 man is not exactly from the James Bond textbook of undercover spying, so we were easily spotted by the opposition, who were eager to inform us that they had actually spied on us earlier in the season and do not think we stand a chance in the play-offs. To a certain extent they were right as Bournemouth turned out to be the best team which we faced in 2004. After a shaky start the Sharks pitcher settled down and the visitors from the south coast were taking control of the game with a lead of 6 – 4 in the top of the 4th inning. The Falcons had a real difficulty getting their offensive game going, while the Sharks seemed confident and always on the verge of a big inning. It is often said that the post-season often gives birth to baseball legends. In 2004 the Boston Red Sox had David Ortiz, Manny Ramirez and Derek Lowe – The Falcons had Jim Denison. Jim came in to relieve starting pitcher, 52 year old Paul Raybould, who had been the basis of the Falcons success all year-long and had given the team another 4 good innings to keep the team in the game. Jim went on to pitch a masterpiece. Over the next 4 innings he completely shut down the Sharks not allowing any runs. The game was turning into a pitching duel as the Sharks pitching staff also kept the Falcons quite and going into the eighth inning Sharks were still leading 6 – 4. In the 8th, the Sharks managed to get 2 runs in after some very good clutch hitting and just like that it seemed like the Falcons season was to end in bitter disappointment. We were trailing 8-4 and not even the great pitching performance by Denison could save us. The game seemed beyond us. After all, we had not scored any runs in the last 6 innings. To top it all off a heavy rainstorm came and over the space of 10 minutes completely flooded the infield. So apart from being almost dead and buried, we had to worry about the game being called and losing it as a result. The Falcons grounds crew had to go into action and quick. And they did. You will not see another grounds crew like the Falcons one that afternoon at any Major League ballpark. The game was able to resume and in the bottom of the 8th inning we managed to score 2 runs and we were only 2 runs behind now. Top of the 9th and Denison shuts the Sharks down again. Going into the bottom of the 9th this was our last chance. A tense situation not only for the players but for the loyal Falcons’ fans who were drenched but their voices were still going strong. Some members of the Falcons organisation who were stranded in other parts of the world were on the mobile phones receiving a play-by-play live commentary from the bench. Falcons first batter comes up, as a female voice from the Falcons area is heard saying – tonk it – well, not exactly. He sees 4 balls in a row and gets to first base. Maybe, just maybe we are still in with a chance. Second batter – walks. The Sharks pitching that seemed invincible was becoming shaky all of a sudden. Third batter – ball 4 – he walks. Fourth batter – sharp ground ball to third base. Third baseman knocks it down but cannot field it cleanly. Runner scores and everyone is safe. Bases loaded, no outs, winning run on second base with the Falcons biggest bat, John del Borrello coming up. The pitch, and a massive swing sends the ball deep in the gap in right centerfield for a hit. 1 run scores. Shunji, from 2nd base, rounding 3rd to score the winning run – 9-8 Falcons. Everyone is on the field to start wild celebrations which go on through the night. 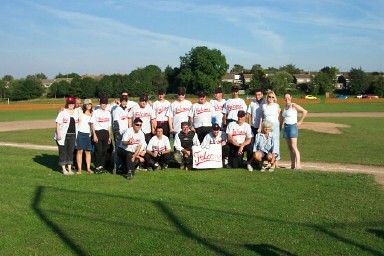 We were now through to the Play-Off final where we once again met the Croydon Pirates. On a beautiful summer day in Hertfordshire, Grovehill sees the largest crowd of the year and the Falcons did not disappoint winning convincingly 27-15. The Falcons will be playing Premier League baseball next year. As Play-Off Finalists the club had earned a place in the Division 1 Final 4 which sees the best from the South against the best from the North with the winner becoming National Champions at Division 1 level. It was hosted by the Halton Jaguars who together with their local council and the BBF had made a lot of effort to make it a very well organised and enjoyable event. Apart from the Jaguars the second team from the Northern Conference was the Sheffield Bladerunners who came with a regular season record of 21 wins and no loses. We had to face them first and we had our work cut out for us. We just could not hit the Bladerunners’ pitcher, Tommy Booth, who actually pitched 3 games in 2 days. Curt Schilling pitching on 3 days’ rest with blood coming out of his ankle was kids’ stuff compared to what this guy did. Anyway, we found ourselves trailing and despite a late rally lost the game 11 – 4. We lost but left our mark on the game in true Falcons style, when the umpire crew ejected the entire team from the dugout. So we had to make a new home for ourselves in the cosy surroundings of a muddy hill, in a wooded area, 30 yards from the field. After the game we found that the Bladerunners also like a drink after a game as we met them in a nearby pub. They certainly were a nice bunch and we hope that we will meet them again at some point in the future. The loss against Sheffield meant that we needed a win against the hosts, the Halton Jaguars in order to meet Sheffield in the final. It just was not to be. Despite a late home run from John del Borrello we lost in a closely fought game 9 – 6. Two games – two losses. We made the conclusion that playing north of the 53rd parallel just does not suit us so we quickly headed back south looking forward to 2005 in the Premier League. 2004 was one of the most successful years in the club’s history and the club’s Awards Night was a happy occasion. The race for the MVP award was a close one between the Falcons’ best hitter, John del Borrello and the club’s Japanese sensation, Shunji. Both had collected most of the other awards earlier in the night and it was time for the big one – the MVP award – which is voted for by all the members of the club. Apparently, when Shunji was submitting his vote he made a pledge to win the MVP award in the upcoming 2005 season. Shunji did not have to wait until next year, as he picked up the 2004 Most Valuable Player trophy. Every year the club likes to award a member of the club with an award to mark an act of sheer stupidity. This year it was John del Borrello. First he broke the record by being nominated in four of the 8 nominations in total for this award. Out of these four nominations the clear winner was John’s actions causing the farce at the Division 1 Final 4 event where the umpire crew ejected the whole team from the bench area, sending them to stand on a muddy hill a long distance away from the field, instead.